Christ! Please ignore the random letters and messages sometimes. For some reason this site barely functions when i type on my phone, and I have no reason why. I made the mistake of buying one of those and it was shoddy garbage. There's nothing holding the extension reader in place, so it pushes right through and falls out, the design didn't even come close to fitting my lid, and some of the holes weren't even fully drilled. I demanded a refund with how shoddy it was. Then later I got one of the deep bay print designs and it fit perfectly. I prefer it. NavK and Anthony817 like this. Well then I guess I know which one I am getting in the future! Thanks for the heads up man! I agree with FireBrandX, avoid it. That design has nothing to hold it in place so you would have to glue it to the inside lip of the case. Also the extension cable with SD card holder has nothing to secure it too. You need to glue everything in place. If the design had mounts that extended to the GDEMU card to help keep it secure it might be deemed okay and sufficient to use. @FirebrandX what design did you end up going with? 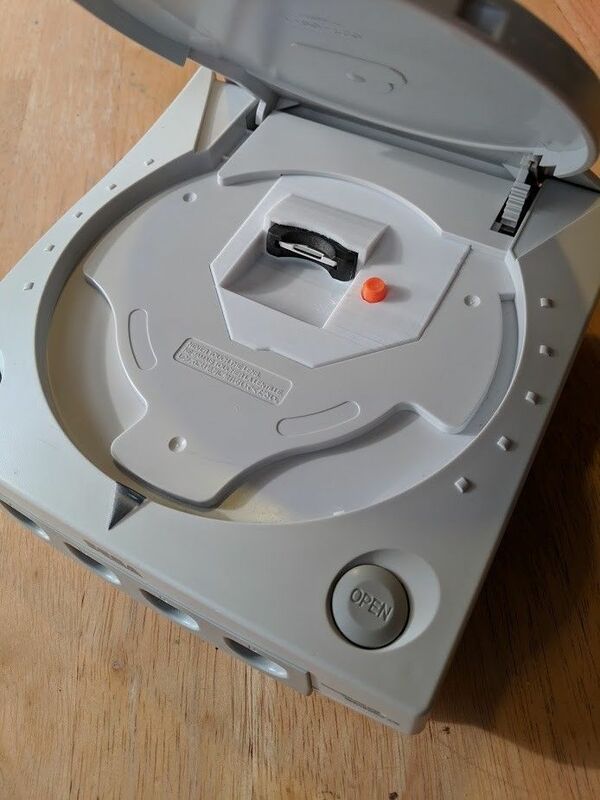 Here's pic's of my Dreamcast and the GDEmu mold. MastaG, Anthony817 and Greg2600 like this. It features an SD card extension as well. He always produces really good designs, so I’m sure it will work better than the cheap eBay ones. Wow, hadn't seen these before. The problem is many ppl like me would rather pay for a finished solution, that is printed, with all the screws. The offerings on Ebay are currently the only ones that do that. I do feel like the ideal one would be like the one I initially posted where you have "walling" around the GDEMU to restore the original airflow, plus a screw-tighted SD reader extension. Hey guys, I'm having a problem. I finally got around to using @madsheep gdemu_sd once again since the last update/fix. Everything seems to be working for renaming/alphabetical sorting all the GDI images within the program, however, it is not so on GDmenu. The titles are sorted alphabetically but It has the old pre-edited naming scheme. I even plugged it back into my PC to make sure the naming scheme I setup was still there, and it was. Does anyone know what could be the cause of this? Also, while trying to figure out this mess, I noticed that a few games that had been for sure working are now broken. Cannon Spike and Carrier to name a couple. I did also update the GDEMU firmware to v5.15 before doing the whole gdemu_sd setup again. So now I can't be certain what is causing the broken games. I thought coming back after almost a full year and reading through 28 pages of this thread and spending countless hours researching would benefit me in being able to achieve my goal of having everything working correctly. Boy was I wrong! LOL. I'm so fed up with this thing I'm about to say screw it. If anyone could help me out it would be greatly appreciated! @-=FamilyGuy=- glad to see your still working on making your tool easier for the end user! Once I figure out this situation I plan on giving GDIshrink a shot considering rebuildGDI broke quite a few games. If I'm able to get it down I would be glad to help you with some testing if needed. I'm using Windows 7 64-bit. This is version 1.10 I believe. ImI not sure if it works on Linux. I think he released the source code to someone in the past so they could make a version for Linux but Idk what happened with that. Yeah I couldn't agree more. It would be great to have everything sticky'd on the 1st page when updated. Probably links to pages for each specific program with tutorials and FAQs would be a nice setup also. I used the Linux version, IIRC it has less features than the Windows one, but it's good at building the list and generating a GDMenu cdi. You might have to copy games yourself and update the GDMenu binaries manually. I think the link is in @madsheep's signature. edit: Also, I've noticed GDMenu SD Card Maker doesn't seem to populate the game titles automatically for me consistently, is there some trick to getting it to properly fill in the title names in it's menu? If I double click the game it shows me it knows the title from the disc, but I'd like it to auto populate the name column if it can? double edit: it seemed to finally populate the titles after a couple loads, doesn't seem to consistently do it though, wish sourcecode was available. in GDMenu I notice that some of my games cause a crash when it is loading the disc artwork on certain titles, anybody else experienced this? When I do IGR every time, no matter what, it always takes me X2 to enter the combo for it to take me back to GDMENU. So I have to hit it once to go back to main screen, and then again at main screen to get back into the menu. GDMENU doesn't really have any home page sadly, and we haven't heard from the creator since 2017. I did try to reach out to him in an email back in August 2018, but never got any kind of reply. I have started to fear something has maybe happened to him unfortunately. There is no released source unfortunately. That was the whole reason I was trying to get a hold of Neuroacid to ask if he could make it open sourced so we could have the ability to let the community update it and add features. However, I found an old post of Neuroacid's where he said the cheat code feature was already in the last release of the menu, it was just disabled. But thanks to detective work by mrneo240 he found it indeed was already in the released build, but not enabled. He also was modding the menu too but then he decided to start work on his own menu that is open sourced. But you can actually see the cheat code menu in my post here. Hopefully we can get a hacked version that re-enables it.